One of China's latest property developers Shiamo Group has revealed designs for China's tallest building set to be located as the centrepiece to the Shenzhen Longgang master plan. 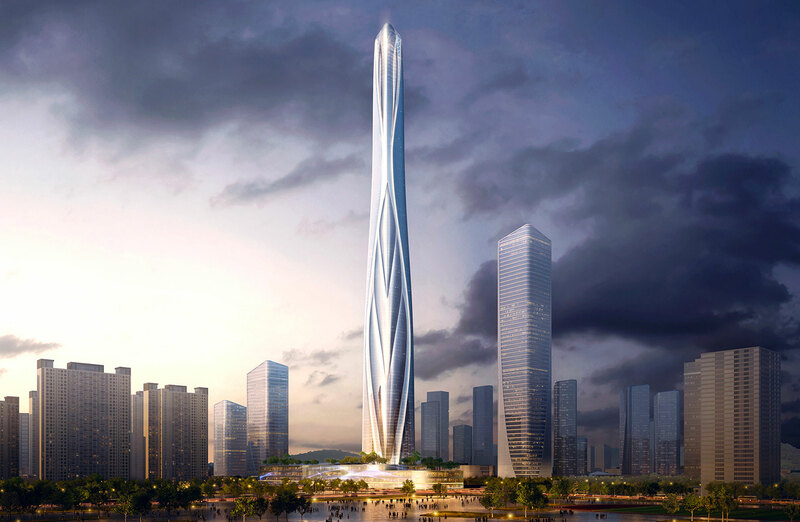 Once completed the Shenzhen-Hong Kong International Centre located in Shenzhen will be the world's third tallest building building behind SOM's 828m Burj Khalifa in Dubai and the 1,000m tall Jeddah Tower in Saudi Arabia. The 701 metre megatall skyscraper has been designed by Adrian Smith + Gordon Gill Architecture, drawing on inspiration from neighbouring districts and "anthropomorphic" in its structure and form. 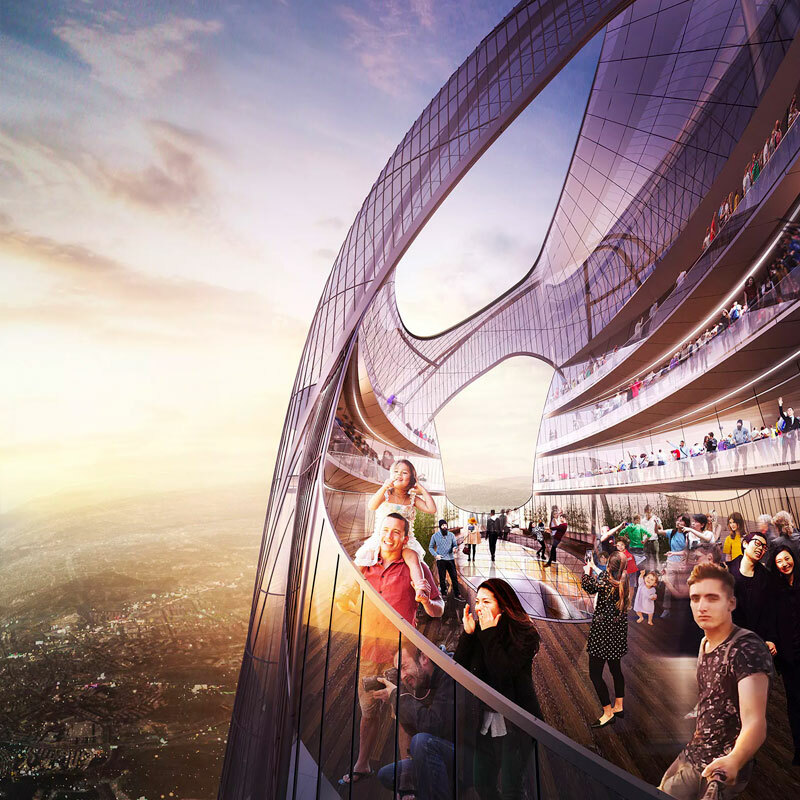 The tower will sit at the heart of the Shimao Shenzhen Longgang Master Plan which will be a mixed-use district with high-end residential, hospitality, office, and retail space along with public landscapes and entertainment facilities. "The Shenzhen-Hong Kong International Centre is anthropomorphic in its character, honouring in an abstract way the athletes that train to perform in the world-class stadiums directly adjacent to our masterplan for this project," AS+GG partner Adrian Smith said. "The result is a muscular expression in high-performance glass, with textured layers that define the elements of its shaped form." The mega tower will also benefit from optimised configuration for the inclusion of water features and a successful microclimate that will improve outdoor comfort throughout the year. The building will be located between the foothills of Longcheng Park and the Dayun National Park, adjacent to several major sporting venues. “Everything in the design is customized to this specific site,” says AS+GG partner Robert Forest said. The tower and surrounding district are being designed to achieve a LEED Platinum rating with the building’s lifecycle carbon emissions reduced by 50 per cent against current practices baseline. “We are improving efficiency in every aspect of the project, thereby increasing value for the entire development,” Forest said. The tower will be constructed using high-performance glass to reduce heat gain, the entire development will be orientated to optimise solar gain and natural ventilation. Shenzhen-Hong International Centre will join a vast majority of the world's super tall structures currently being designed and constructed in Shenzhen, a city which accounted for 10 per cent of the 2018's record number of mega skyscrapers completed worldwide.